A happy Monbulk Hawks team. 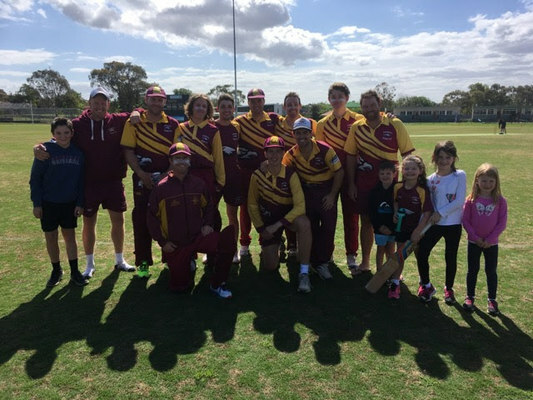 In honor of the Melbourne Cup Day weekend, a round of T20s were played in the ones and twos. In the ones, Monbulk travelled to Lysterfied in a top-of-the-table clash that always produces a good game. Losing the toss again, Monbulk tried to take the pace off the ball early, with Lysterfield taking control to be 34 before the fall of the first wicket. Steady wickets were the key to limiting the Beavers’ total. Duncan Maher then proceeded to mop up 3/10 with some sharp bowling to limit the total to 8/104. Monbulk opened up with the experience of Jason Fraser and Captain Cosstick, who put on a run a ball 14 before Fraser departed. Braden Taeuber then pushed the score along nicely to 59 before Braden was run out for 22. Cosstick then edged behind off a spinner to make things a little interesting before Monbulk eventually won with several balls remaining. The win pushed the ones into equal first position, with Lysterfield with a two-dayer against Rowville at home. Monbulk’s twos put in a strong performance with the bat to set Knox Boronia Churches 131 from their 20 overs. Skipper Martin was again in the runs with 71 off just 41 balls, with the ball regularly being retrieved from the arboretum across from Dobsons Reserve. With the ball, Josh Spencer took 2/28 and several other bowlers all picked up a wicket. But with 22 extras it was always going to be tight and so it was with five to defend and Marto with the pill. The first five balls went for two runs and contained two wickets. With three to tie, things went awry and KBC were able to slap away a four to claim the win. Next week sees the twos travel away to challenge Rowville. A full weekend of games awaits Monbulk’s Junior Hawks, with both Friday night and Saturday morning teams resuming their seasons.